Let me guess – the ultimate game day is coming up and it’s your turn to host the Super Bowl party this year. Despite the fact that you gather for the game (*cough* commercials *cough*) and hang out with your friends, really we all know the most important part of Super Bowl Sunday is the food. And maybe, just maybe, you want to upgrade from chips, dip, and pizza this year and are on the hunt for some unique Super Bowl recipe ideas. Well you’re in luck, my friend, because I have a bunch for you. These recipes are so good that your friends will think you brought the ultimate game to the Super Bowl party — no matter who does or doesn’t get a touchdown this year. Have vegan friends coming? No problem. Paleo friends? Also not an issue. People who are adamant about spending this day eating junk food? Trust me, this list has it all. From chicken wings to peanut dipping sauce, mini taco bites, and spicy grapefruit margaritas, you’re about to serve up the ultimate game day menu. So get out that pen and paper and start making that very long Super Bowl grocery list — because it’s game time! For an easy way to please all sorts of dieting types, set up a taco bar like this one from The Kitchn! How freaking cute are these little chocolate-covered strawberries by Domestic Fits? Some go for the chips and salsa on game day. Me? I like them soft pretzels with mustard (or cheese) sauce. Recipe by Table for Two. For a healthier dip idea, try this peanut dipping sauce by Cookie and Kate! This tofu by Averie Cooks is the perfect appetizer for the vegetarians attending your Super Bowl party! Can’t really have a party without party punch! Recipe by Natasha’s Kitchen. Wait you’re not supposed to dip pizza? Try this recipe by My Baking Addiction and think again! The snack you always want to order out but never have at home — now is your chance with this recipe by Table for Two. 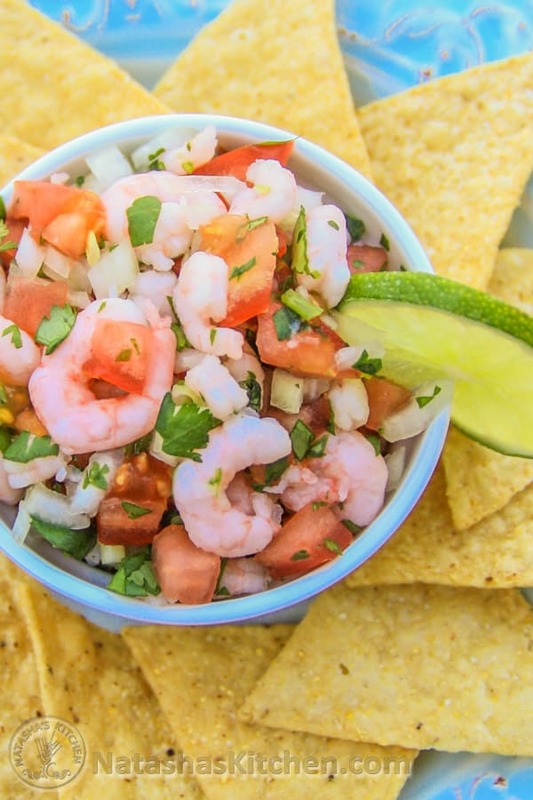 Ditch the salsa and dip some chips into this shrimp ceviche by Natasha’s Kitchen! A very unique bite-sized snack packed with flavor by Averie Cooks. A total different spin on your margarita – try using grapefruit with this recipe by Cookie and Kate. The flavors in these fries by Averie Cooks will make you forget the fact that they aren’t greasy at all! An easy bread by Prevention RD to cut up and serve to a large group of people. Why use thin chips as the nacho base when How Sweet Eats found an even heartier version? Most people go for the bacon wrapped dates for a sweeter taste, but not Damn Delicious. She’s going all out with these salty bacon wrapped tater tot bombs. This recipe by Cookie and Kate will please all your vegan friends coming to your shindig. And for your paleo friends? This chile lime chicken wing recipe by Nom Nom Paleo should do the trick! For a much cleaner way to serve tacos, put together these bite size tacos by My Baking Addiction. It really can’t be a Super Bowl party without some serious sliders – especially if they are stuffed with cheese like this recipe by How Sweet Eats. Mouth currently watering. These tacos by I Am Food Blog probably won’t even make it an hour into the party. And for your vegan/vegetarian friends — the butternut squash taco by Cookie and Kate. Also probably won’t last an hour into your party. Sushi is way to expensive and hard to serve in large quantities– so make these nachos by I Am Food Blog instead! Dip crackers and vegetables into this delicious cheese ball by My Baking Addiction. Usually people are settling for burgers and hot dogs during game day, but why not surprise them with these Italian roast beef sandwiches by The Comfort of Cooking? If you’re not into dipping your pizza (see above) then just go for the classic pizza, like this one by Cookie and Kate. These crispy fries by The Comfort of Cooking are an alternative to your go-to chips and dip. Last, but certainly not least, every good Super Bowl party needs a crockpot full of pulled pork (like this recipe by My Baking Addiction). The two just go together.